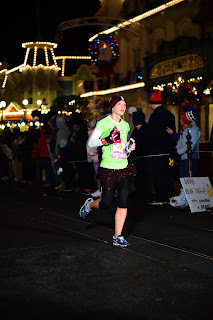 The biggest lesson I learned during the 2018 Walt Disney World marathon was not to cry while running because you can't breathe. 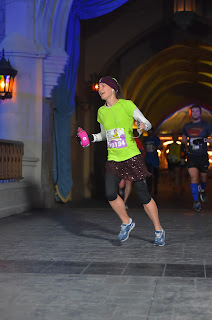 Ideally, I'd like to do the trip reports and race recaps from Dopey 2018 in order, however, I'm still having some photopass download issues, so I'm starting with the headliner: the marathon. First of all, purchasing race retreat for the marathon was one of the best decisions I could have made. I look at it as "weather insurance." If it's a nice morning, you really don't need the heated tent, but if it's cold, it's a lifesaver. Since marathon weekend this year was SO cold, I was very glad for race retreat the morning of the marathon. I hopped on the first bus leaving Port Orleans: French Quarter and before I knew it I had arrived at the staging area. 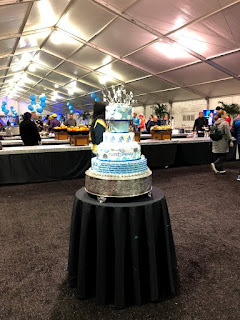 I made my way to the race tent and was glad to get out of the cold. I got a cup of coffee and looked to see who the character meet and greets were. Race retreat typically has different characters than the ones in the regular pre-race staging area. I got to take my picture with Peter Quill aka Starlord from Guardians of the Galaxy. Doctor Strange was also available for photos. After getting my picture taken, I decided to rest a bit. Around 4:30AM, I started to make my way to my corral. 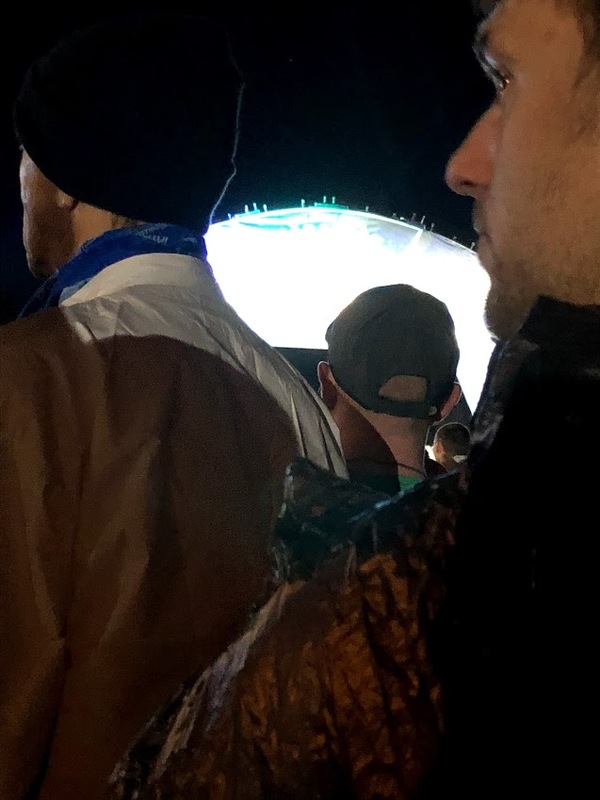 Because I knew the marathon was going to be a long race, I wasn't AS concerned about making my way to the front of my corral. I got close enough to the start to go with the first wave of Corral A. Not the best picture of the start line, but there it is. 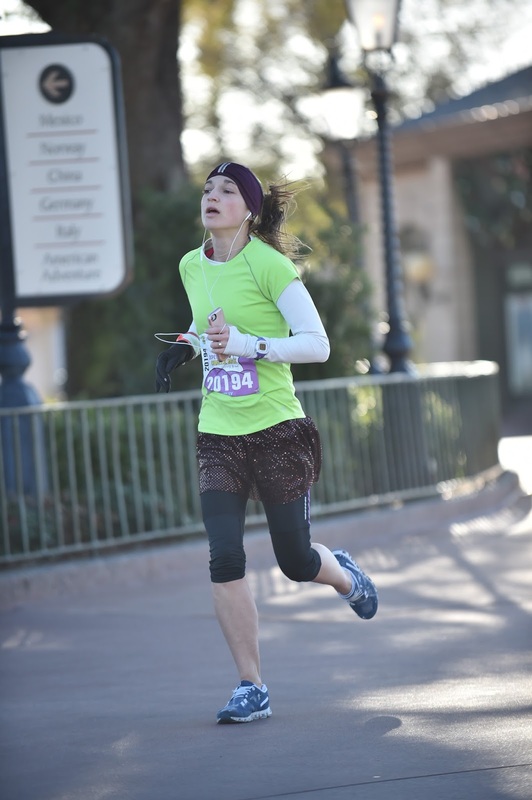 The course took us out of the Epcot parking lot and on the highways towards the Transportation and Ticket Center and to the main entrance of Magic Kingdom park. The new course this year had us running right through the main gate of Magic Kingdom with the citizens of Main Street U.S.A. cheering us on from the Main Street train station. It was a great moment. Running down Main Street U.S.A.
My mom was waiting for me on Main Street and I got to see her cheering before running the rest of the street. There is nothing better than running along Main Street, hearing the roar of the crowd, with Cinderella Castle lit up in front of you. It's a completely magical moment. I started to feel my eyes tearing up, but then I couldn't breathe, so I had to force myself to pull it together! Once we were out of Magic Kingdom, we ran past the Grand Floridian and then on the highways on our way to Disney's Animal Kingdom. I knew that Nicole, her sister Danielle, and some of their friends would be at the exit of Animal Kingdom, which definitely helped me get through this stretch. Typically the 13.1 mile marker is the most depressing part of the marathon. You've run a half marathon and you still have another 13.1 miles to go...it's just rough. But looking for those guys helped distract my mind. The scenery in Animal Kingdom helped a bit too. First of all, the out and back going into Animal Kingdom was awful. Ugh, definitely one of my least favorite moments of the course. 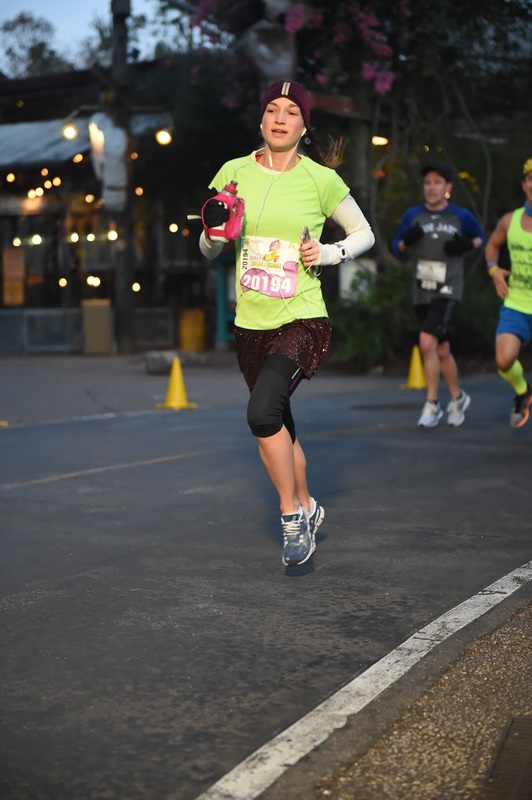 I loved running through Animal Kingdom, it's becoming one of my favorite parks. Upon exiting Animal Kingdom, I saw the cheering section, which was awesome. Definitely gave me the push I needed heading into ESPN's Wide World of Sports complex. I got a little choked up by this too, but then I couldn't breathe so I had to put a check on those emotions. As you can tell by these photos, I was working hard. Right around mile 20 I looked at my watch and knew that barring any unforeseen disasters, I would be able to qualify for the Boston Marathon. 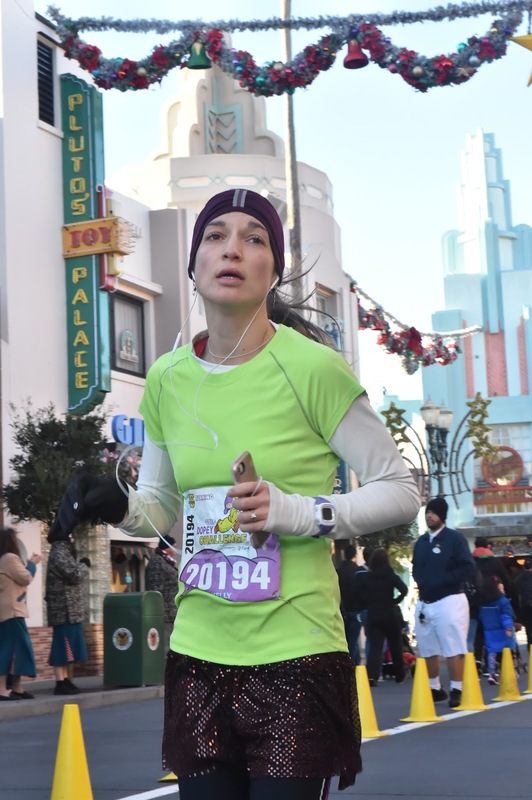 I put my head down and tried to stay focused for the next 10K. Luckily, I knew there would be plenty to look at from here on out. Running through Disney's Hollywood Studios was a blur, and not just because we spent less than a mile in the park. I was so locked in that I barely remember the last 6-ish miles of the race. I know we run through Boardwalk, but I have no memory of actually doing it! I just kept looking at my watch and putting one foot in front of the other. 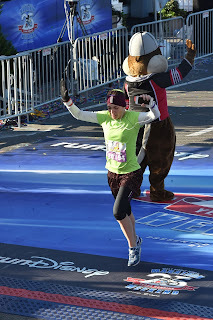 At this point, I knew that I would achieve my "A" goal of qualifying for the Boston Marathon. Every time I found myself thinking about this, I would start to get emotional, and then not be able to breathe. Once again, I found myself having to focus and shut out the emotions of the moment. 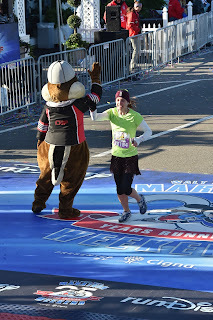 High-fiving one of the chipmunks at the finish line! As I came down the final straightaway, I could see the finish line and hear my family cheering for me. It was a great moment and an amazing feeling. Looking at the clock, I knew a BQ was mine. I finished in a marathon PR of 3:24:50 and I couldn't be more proud of that time! After finishing the race, I burst into tears, the emotion of the moment finally overwhelming me. A very nice medical volunteer came over to see if I was okay. I explained to him that I was fine and just emotional. One thing I've learned from the marathon experiences of others is: do not get grabbed by medical except if it was absolutely necessary. All I really needed was a good cry and a bagel. So, sorry to the sweet medical volunteer that I basically ran away from! 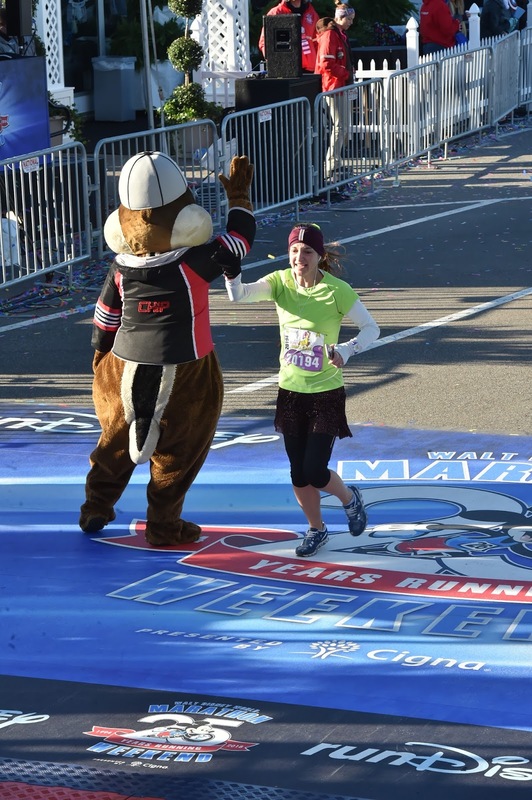 Final thoughts: I NEED to do this marathon again. I want to run it for fun and take character pictures! It killed me to pass up a couple of those unique stops: Hades with Pain and Panic, and Carl, Mr. Fredrickson, and Dug. 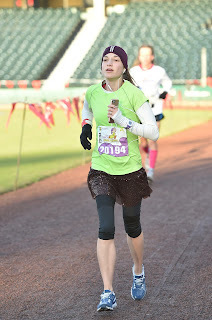 I love stopping for character pictures, but I knew that if I wanted to BQ, then I would need to skip those this race. 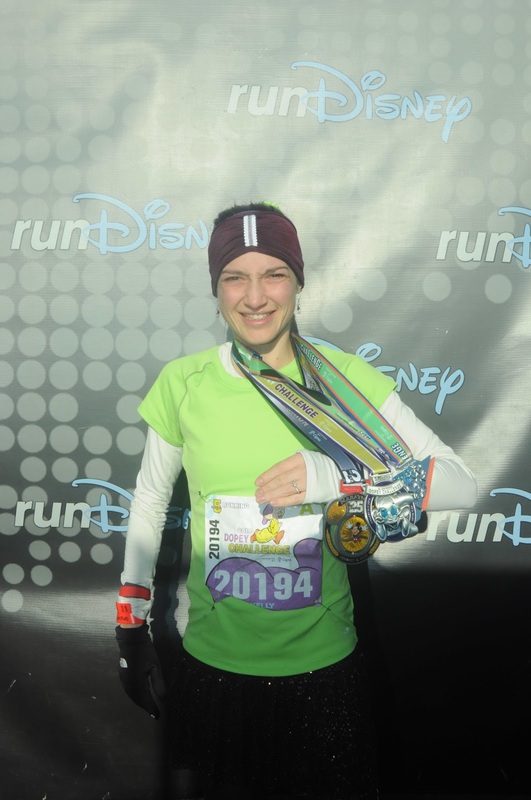 The Dopey Challenge was a great overall experience and I had so much fun and I can't wait to do it again! Happy National Pet Day Pluto!